…for the newly formed End User Computing division at Vmware. This week at VMworld 2010, we announced a strategy and set of new and emerging products that will help businesses and governments move beyond “IT as a Cost Center” to a more business-centric “IT as a Service” model. I am excited to finally be able to tell you about what we have been working on for a key component of this new IT model – the top layer of a modern IT architecture – End User Computing. We have come a long way since this company launched our first desktop product, VMware Workstation. From that humble beginning we revolutionized the idea of virtualization, and radically simplified the data center with products like ESX and then VMware vSphere. We also created the virtual desktop market with the introduction of VDI 1.0 (now known as VMware View) in 2007. We love this market and have created solutions that are as innovative as they are simple. Along the way, we have also helped customers deploy tens of thousands of virtual desktops. It is because of this ongoing love affair that the VMware View team is particularly proud to announce another major View deployment at VMworld. The Bank of Tokyo-Mitsubishi UFJ, Ltd recently deployed 3,000 end users on View 4.0 and is in the process of rolling it out to another 14,000. View 4.0 has been a real tipping point for us in terms of customer adoption and deployments. But that was yesterday, today is a new day. At VMworld 2010 we are announcing VMware View 4.5, which will ship in early September. You can read Scott Davis’ blog to learn all about the great innovation that went into this release. As customers start to run VDI solutions at scale, we invested a lot our development cycles in making VMware View 4.5 even easier to manage and more scalable. View has been recognized over the years as the best integrated solution for VDI on vSphere. With this release, we are raising the bar even further with a newly designed, single management console. We are also doubling the scalability per each individual pod from 5,000 to 10,000 desktops. We are dramatically increasing the number of use cases for virtual desktop technology by lowering the upfront infrastructure cost to a new record low of $252 per seat, and by introducing the first offline VDI solution in the market. View 4.5 Local Mode allows users to check out their virtual desktop from the data center and take it on the road with them with a standard laptop. The VMware View 4.5 team should be very proud of these accomplishments. At VMworld 2010 we are also introducing project Horizon. This is an exciting R&D initiative that we have kept under the radar for a while now. Horizon is the result of a lot of new thinking at VMware around the future of end user and cloud computing. Under the leadership of our executive team, we have refocused our commitment to solving the client computing issues that our customers care about most. After all guys like Paul Maritz who led the development of Microsoft Windows, Richard McAniff who led the Microsoft Excel and Office team, and Tod Nielsen who built MSDN, know how to build compelling end user computing solutions. They asked us to think outside the box and look at the next set of challenges that our customers need to solve. 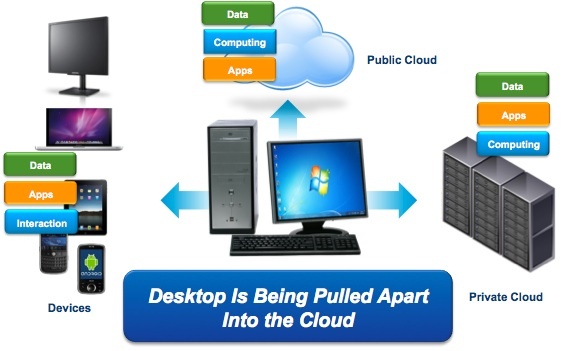 The desktop as we know it today is being pulled apart by the cloud. VDI is definitely a fundamental first step to solve this puzzle. By modularizing the desktop and delivering it as a managed service with better security and manageability, customers can create better user experiences and gain more control. We need to build upon our success in VDI and move beyond the Virtual Machine and the Hypervisor into the next level of abstraction – abstracting applications (including SaaS) and data. In our personal lives, the cloud has spoiled us rotten as end users with high availability, along with ubiquitous and immediate access to information and applications. But this is not yet the case within the enterprise. Our vision is to bring that consumer type of experience into the enterprise. We need to help our customers build the foundation of their private clouds so that they can achieve the same level of service, speed and reliability that the public cloud offers today. We need to help them centralize and manage applications and data so that they can be delivered to end users on any device with the right level of security and compliance. Project Horizon shows the direction that we are undertaking and we are all very excited about it. A part of this transformation and increased commitment to this space, we created a new business unit within VMware, the End User Computing business unit, which includes our end user computing assets along with the desktop business unit. See you around at VMworld 2010, don’t miss the End User Computing supersession on Thursday and the party Wednesday night. ← VMworld is Next Week!! !